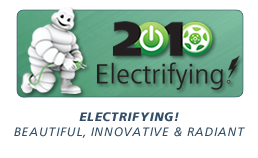 The 2010 Michelin Challenge Design, “Electrifying: Beautiful, Innovative and Radiant,” was born of the recognition that there were a number of innovative technologies emerging within the technical and design communities to support the electrification of vehicles, as well as the renewed importance of an aesthetically and functionally beautiful execution. Michelin and the jury were looking for concepts that could dramatically improve energy efficiency and satisfy consumer demand for an attractive and usable vehicle design. The jury selected 27 drawings for display at the 2010 North American International Auto Show, as well as 9 scale models. These works were complemented by the display of full-size vehicles including the Venturi Volage, the Nissan MIXIM EV, and the a replica of the first vehicle to go more than 62mph, the La Jamias Contente—an electric vehicle built in 1899.